At the time of its founding, the International Republican Socialist Network remarked that while the immediate task of the IRSN is to build awareness of and support for a republican socialist analysis in those nations where a basis for such an approach to revolution exists, that we recognized the appropriateness in other circumstances of other tendencies within the revolutionary movement, including Pan-Africanism and Pan-Arabism. 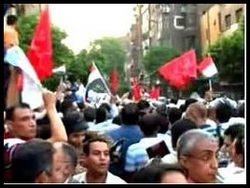 The present wave of protests and revolutionary agitation in Tunisia and Egypt, on the one hand, and the revolutionary sentiments and action the events in North Africa have helped to encourage in Jordan, Palestine, and elsewhere in the region, highlight this perspective advanced at the outset of building the IRSN. The fact that the two Maghreb states presently witnessing revolutionary uprisings stand astride the revolutionary state of Libya creates a tremendous opportunity for those revolutionaries embracing Pan-Africanism, Pan-Arabism, or both, to point the way forward to the working people of the region that is offered by building on the existing objective basis for uniting the movements in all three nations into something far larger than simply the sum of the parts. Moreover, the spread of the revolutionary current into the Arab world, provides further opportunities to re-examine and renew the vitality of the unifying sentiments that were long the dominant ideology of the region. The comrades of the IRSN applaud the revolutionary action of the working people throughout North Africa and the Arab world and encourage those presently engaged in these protests to recognize that only by ensuring that their political demands are wedded to efforts aimed at ending imperialist intervention throughout the region and displacing the capitalist elites, who are inseparably tied to the imperialists, will they be able to achieve their objectives. In today's world, no people can hope to achieve improved sovereignty without ending capitalist control over material resources and displacing the capitalist class from government. With the revolutionary legacy of Socialist Pan-Arabism and Socialist Pan-Africanism in mind, the comrades of the IRSN say, long live the spirit of Nasser. Forward to socialist revolution throughout the African continent and the Arab nation!